This is the only bathroom we have renovated so far. We did it three years ago with a budget of $1,000. 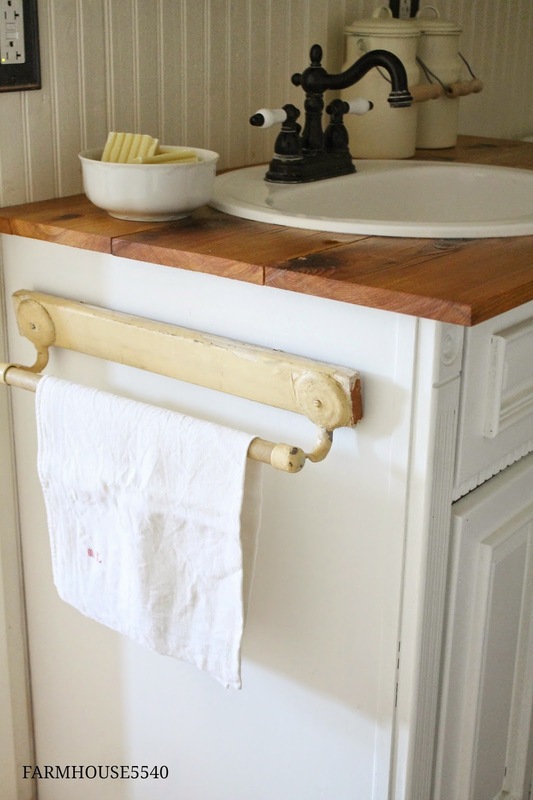 We love to reuse and salvage as much as possible so we were up for the challenge. It was disgusting and oddly shaped and I had to just pretend it wasn't there for over two years until we could afford to gut it and rebuild it (that is what I am currently having to do with other bathroom at the time). 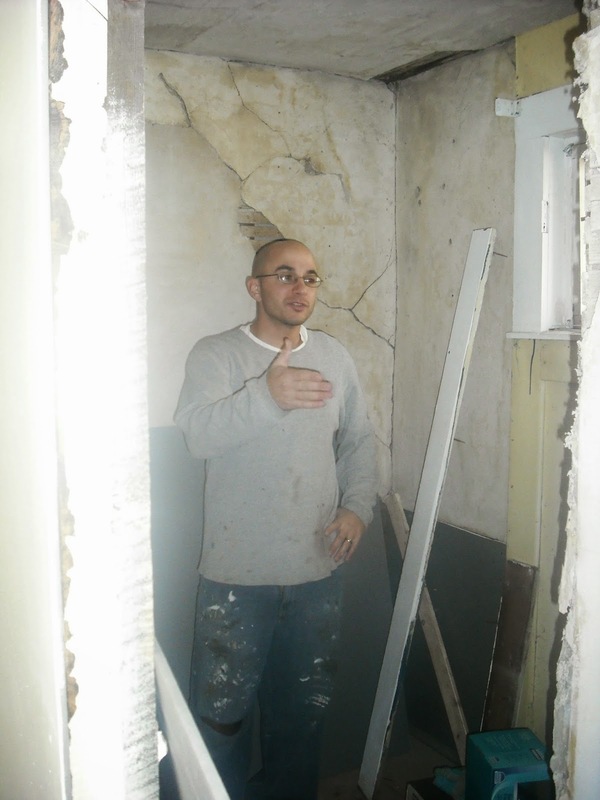 The below picture shows how it looked from the outside (what is this area now), this is after I ripped down the paneling and striped down the bright orange moldy wallpaper which ended up being pointless because we tore this whole wall down anyways. There was a really gross shower behind this wall, I didn't even think to take pictures of it but now I wish I had. We lucked out because right at the time we were doing this bathroom my sister was renovating hers and she was throwing out this vanity and mirror. They fit in the space perfectly and once I painted them white they looked 100% better. 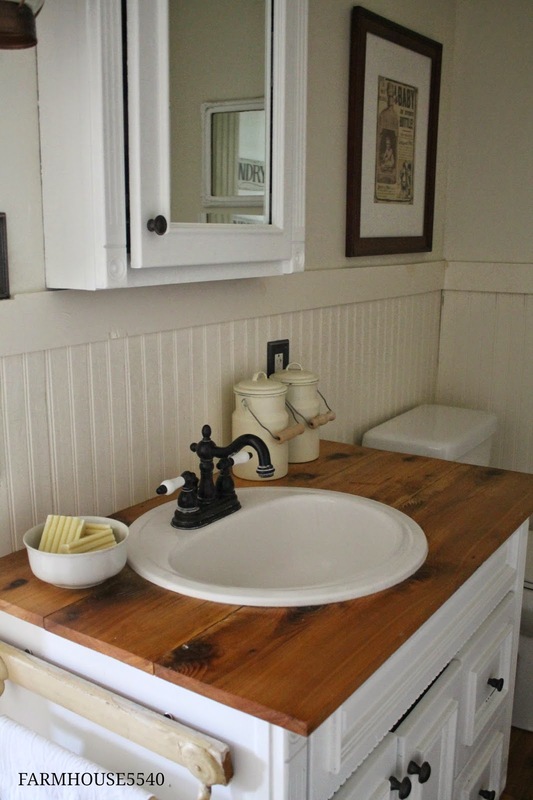 Neal made the vanity top with the wood that had been covering the walls of what is now our family room. It was rough cut and stained a dark finish, but a couple runs through the planer and we discovered that it was cedar! The dark stain had turned the under-layers a beautiful golden color. 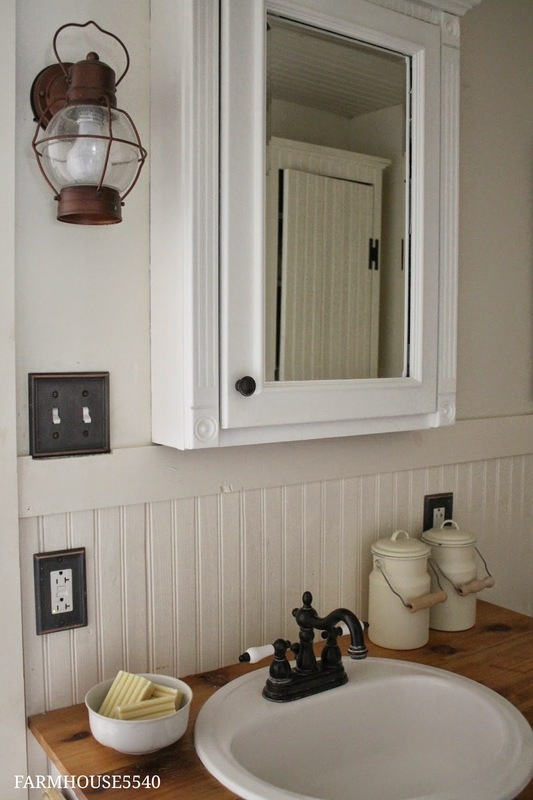 We bought a $15 enamelware sink from the Home Depot and I found a $30 faucet on Overstock and it all came together. I put about six layers of semi-gloss polyurethane on the wood to keep it safe from water damage. 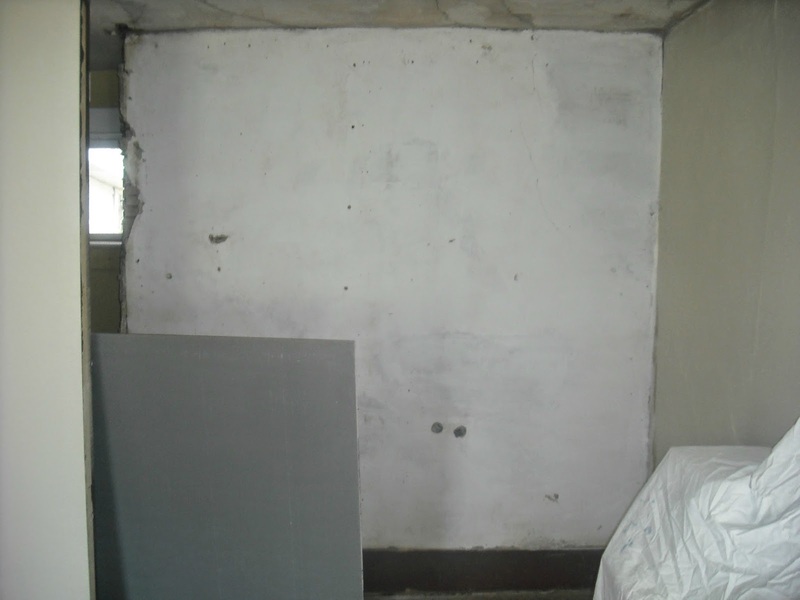 We tried to save as much of the original plaster in here as possible but we had to patch certain areas with drywall. I did layer after layer of skim coat to get it all to look like original plaster work and also so that the plaster and drywall would blend together seamlessly. The key is lots of thin layers and lots of sanding. 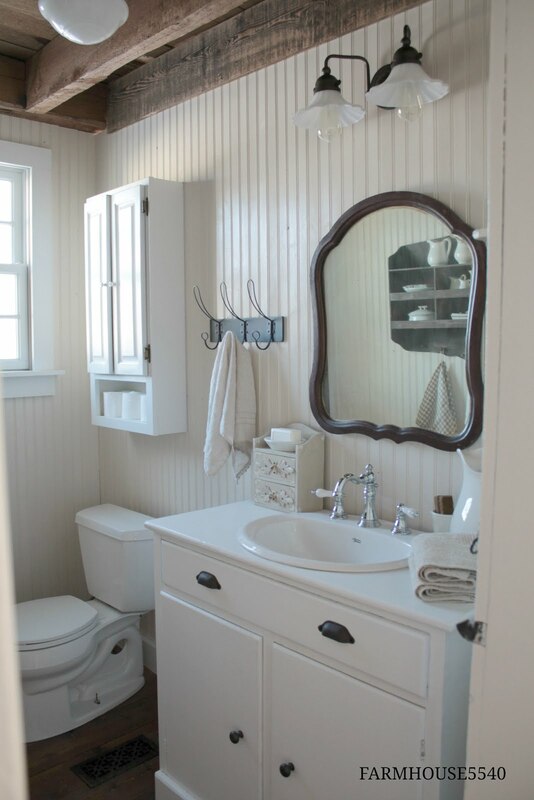 Then I painted everything Behrs "Cottage White". I bought a $10 antique transom window for above the door so that we could get some natural light in the bathroom when the door was closed. The floor is done with the same cedar that we used for the vanity top. Which really worked out because there was no way we had money in the budget for flooring. 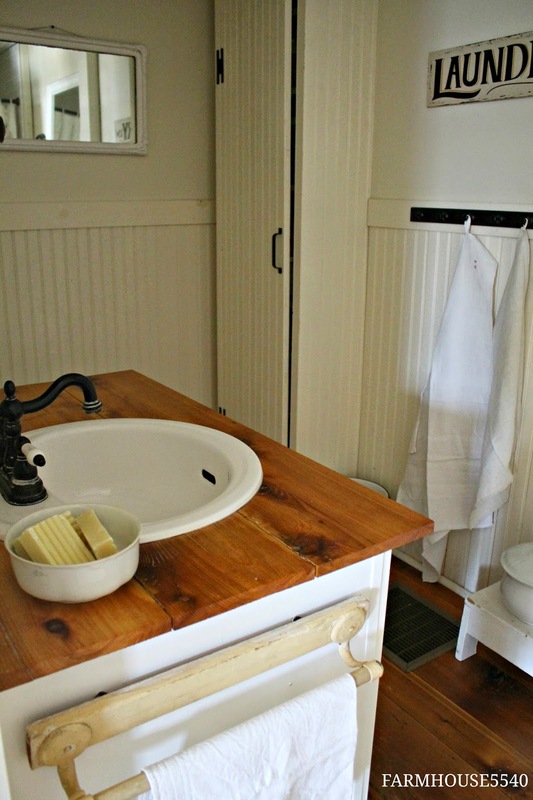 I treated it the same way I did the vanity top, with many many layers of polyurethane. By taking the old wall down and making the room a rectangle we were able to fit a full size tub in and then we subway tiled around the walls above it. The cupboard is one that Neal built for our first home and ended up fitting perfectly in this space, and it is just the right size to hold all of our towels. Eventually we plan to put a window where the mirror is. Over in this corner Neal made a built-in cupboard out of a tall and skinny bookcase that he had built for our first home. He made a door for it and then covered the whole thing in bead board, it looks like it's always been there, which is always my goal. Ya'll are doing a great job. Everything looks so pretty. Great job Megan. The bath looks so great. Very pretty. 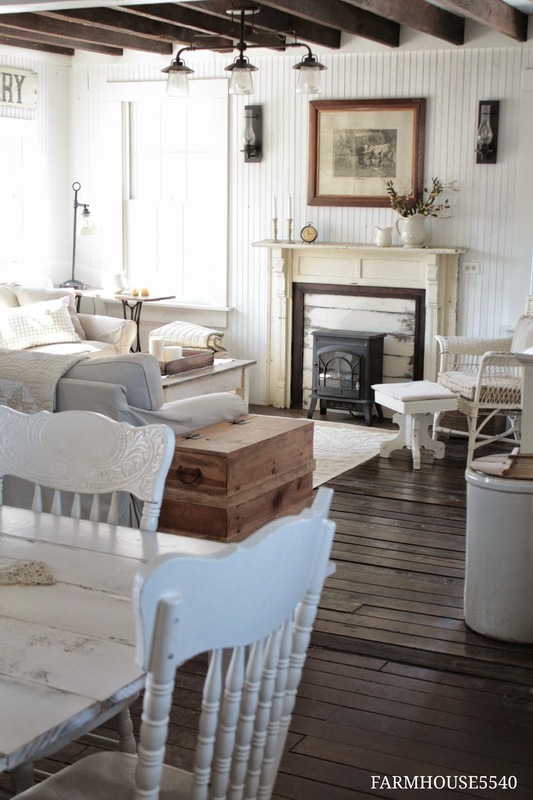 I am in love with your gorgeous cottage!!!! what an amazing style!!!. Flavors of the past... all the details are so so pretty... Thanks for sharing! 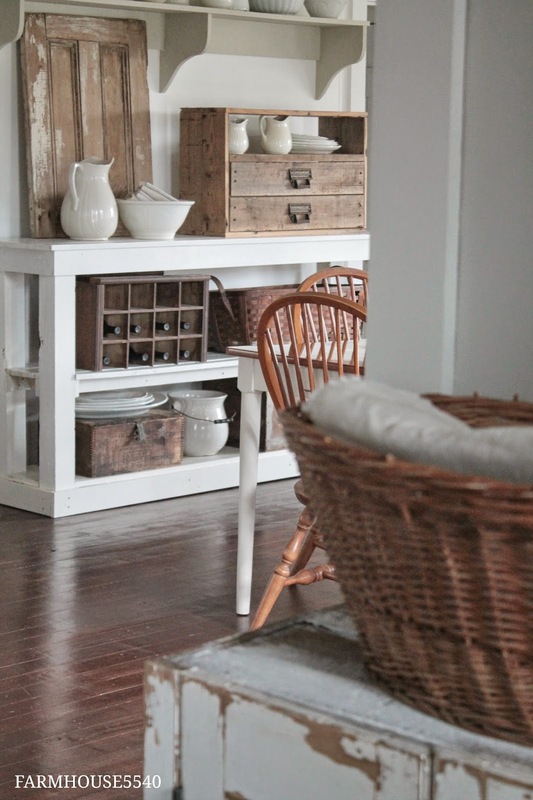 wow, love it, just plain, simple farmhouse goodness...gotta love it!!!!!!!!!!! Nice job! It's amazing what a fresh coat of paint will do for things. 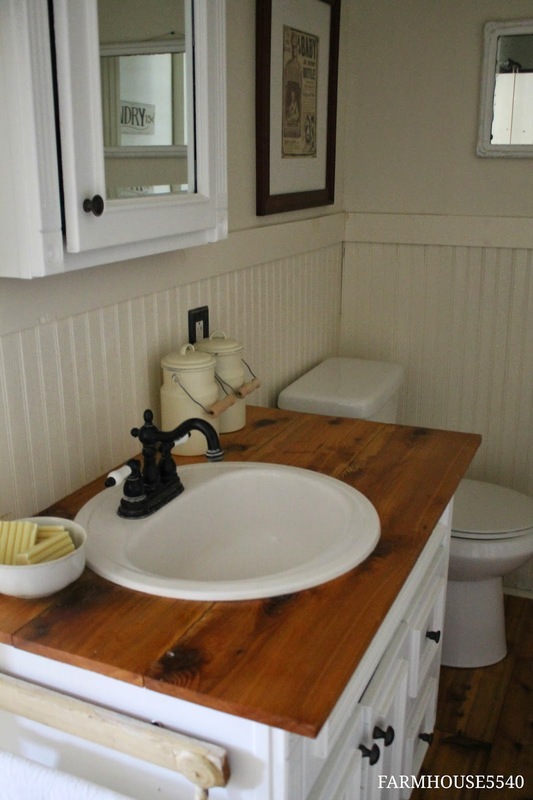 The vanity looks great..love your choice of faucet too. Thanks for the inspiration. love it! I've got it pinned. thanks for so many good ideas. Beautiful! I even love the switch plates! 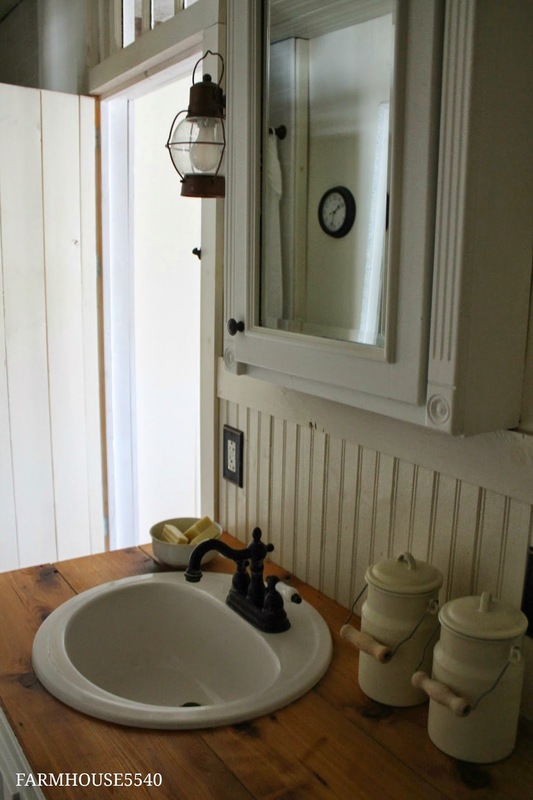 The transom window is an idea I'm going to look into, I am a big fan of light after living in an 1880's log cabin. 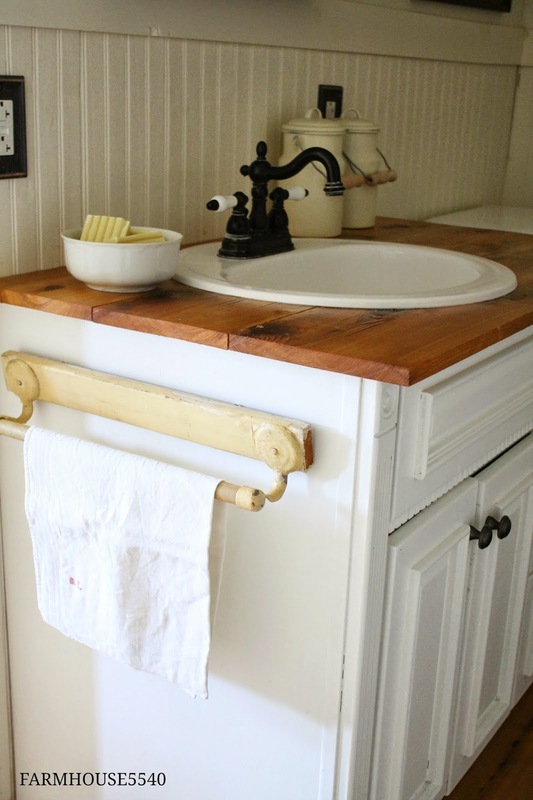 The wood counters are beautiful. 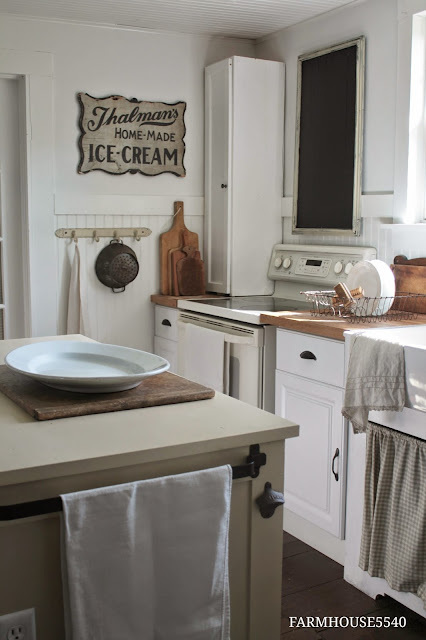 My contractor has suggested wood countertops for the kitchen because I am having a meltdown over the prices of countertops.I cook every day, so don't know if that will work. And I must say, you find great ways of incorporating built-ins in place of furniture. The look on Neal's face is what I've been getting a lot of from my contractor (lol)! It's great that in the end we always get what we want with just a little coaxing! 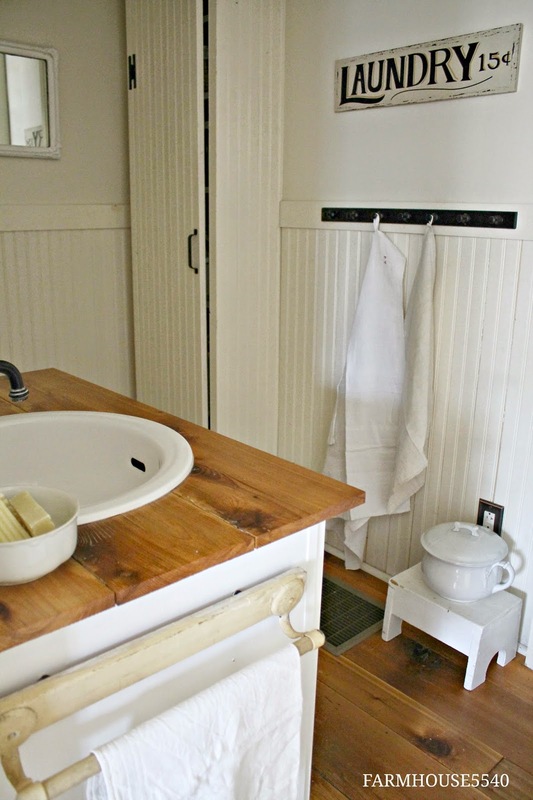 Just for future reference, did you know there is ceramic tile beadboard? Yeah, sorry, it's expensive, but I sure love it!! Thanks for this post, I needed some bathroom ideas! Wow! I would have had no idea what to do in that space! Those walls in the shot behind Neal would have had me so discouraged! 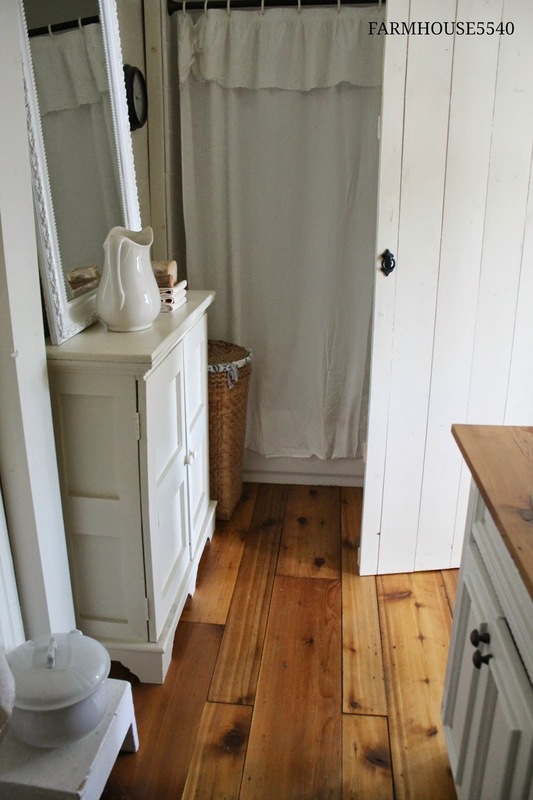 Way to make that bathroom look lovely and welcoming! Sometimes the challenge of a small budget forces creativity. ..In your case you ROCKED it! Beautiful job. Love your work. You two are so talented! It's just beautiful! You continue to amaze me. Keep up the good work. 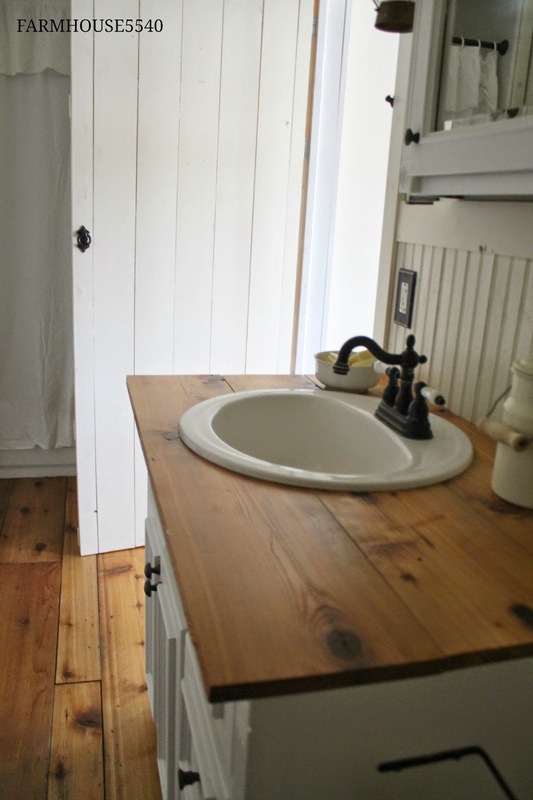 The wood counter tops and floors look great! Lové it, and would feel comfortably at home if it were my bathroom. Delightful, as always. Looking forward to more transformations. I love all the details that make it look like it was there when you moved in! Did you find the sconce in store or online? Was wanting to check price but having trouble finding it. Thank you! 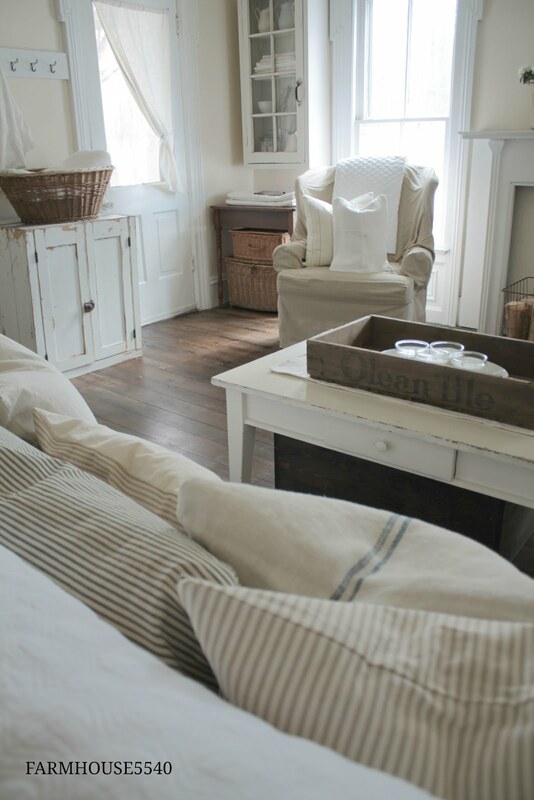 Lovely farmhouse bath. I have solar lights like your light in my gardens. 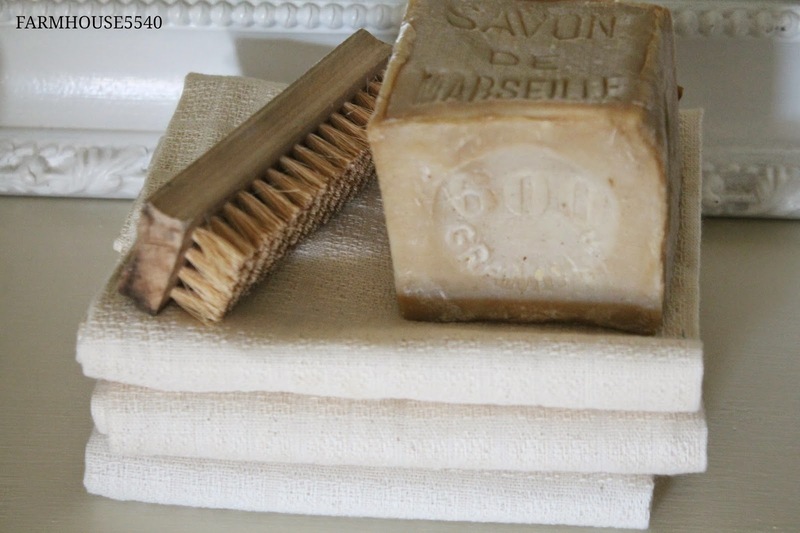 Looks great in your bath. 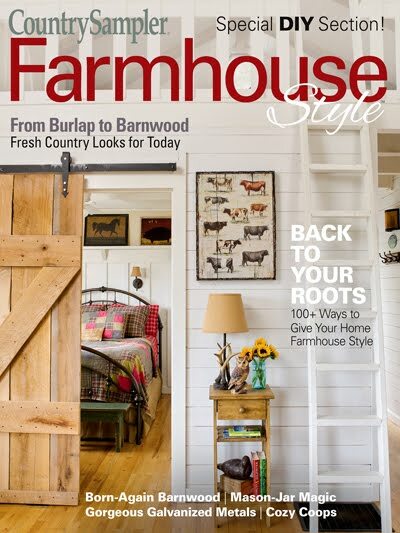 Every room in your home is just magazine perfect. This is one of my favorite blogs to visit. 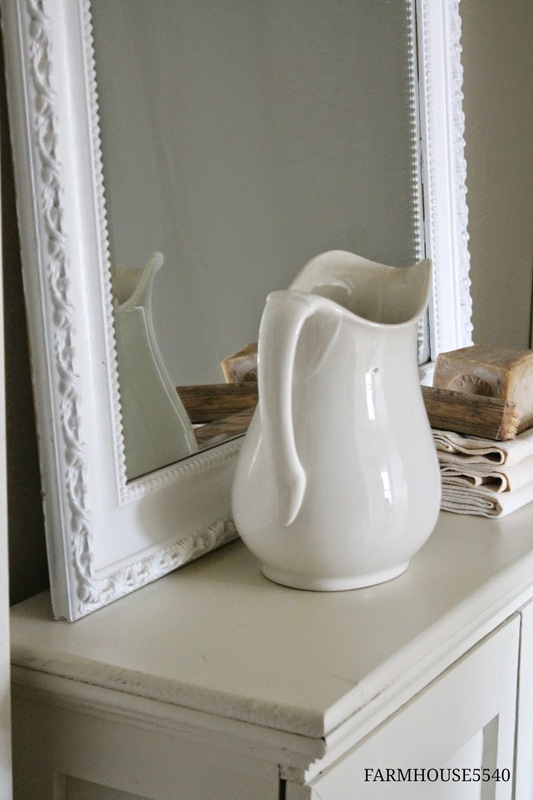 Do you know where your sister originally purchased the medicine cabinet?